The Clacton fallout has sent a few tremors around Westminster. So has the Heywood & Middleton spin-off. Not only have the people elected their first Ukip MP in a relatively safe Tory seat; they came within a whisker of doing so in a Labour stronghold, reducing a 6000 majority to a delicate 600. Douglas Carswell won 59.7% of the Clacton vote; John Bickley won 38.7% in Heywood & Middleton. Commentators can quibble over the collapse in the Tory and Liberal-Democrat votes, and cavil over Labour’s dire performance just seven months before the General Election. But there is no doubt that the people want change, and, with these jumbo vote-shares, the rise of Ukip points to the tenor and tone of the desired revolution. This is a cause of dismay to some clergy, who are taking to their Twitter, Blogger and Guardian pulpits to warn of the impending wrath and immanent judgment should such political idolatry and democratic rebellion continue. We know that the Rev’d Giles Fraser “despises” Ukip, and we know that the Bishop of Willesden believes them to be “vacuous” and “a blot on the political landscape”. He sees it as a pastoral duty in Willesden to “persuade people of the errors of Ukip”. When asked why those errors are any more egregious than those of Labour or the Liberal Democrats, he responded: “because they are racist?”. The question mark is superfluous: for Bishop Pete, Ukip’s racism is an established matter of fact. When asked very politely to explain how he understands racism and which policies point to this iniquity, he sidestepped definition with the response: “Policies are weasel-worded.” And he adduced three articles to establish the veracity of his case. They were Alex Andreou’s article in the New Statesman: ‘Is Ukip a Party of Bigots? Let’s look at the evidence‘; Mehdi Hasan’s article in the Huffington Post: ‘The Great Ukip Racism Debate: Debunking the Six Main Myths‘; and Hugo Rifkind’s Spectator piece: ‘If Ukip aren’t racist, how come so many racists seem to like them?‘. All impeccably dispassionate, equitable, neutral and politically unbiased journalists with absolutely no motive for artful chicanery or any agenda for falsehood or guile..
One wonders what persuasive evidence the Bishop of Willesden might accept as proof that Jesus was neither crucified nor resurrected. The infallible assertions of the Qur’an? An irrefutable treatise by Richard Dawkins? The compelling biblical scholarship of the National Secular Society? Some Ukip-ers may indeed be racist. But so are some Tories, and so are more than a few Socialists and Liberals. And so are some Christians. But, surely, the best way to establish whether or not (or the extent to which) this is institutional is to scrutinise statements of policy and interrogate their meaning and potential consequences. You can’t dismiss political policy as “weasel worded” without simultaneously relegating the Christian creeds to doctrinal equivocations and suppressio veri. The written word is fractional and imperfect, but it points to truth and reality. That would be a good line on which to end the homily. But Father Giles and Bishop Pete just won’t let this go. Yesterday, the vicar tweeted: “Poor @His_Grace wont much like this. http://theore0.wordpress.com/2014/10/10/an-open-letter-to-nigel-farage/ Now we are all at it.” And the Bishop tweeted: “And the deserving/undeserving stuff that Tories and UKIP get into is profoundly unChristian. Imago Dei, not Victoriana.” For Bishop Pete there is already an apparent Tory-Ukip pact on social policy and welfare reform. The piece by the Rev’d Andrew Lightbown to which Giles Fraser links is intelligent and thoughtful in its theological understanding of complex issues of identity and culture. It is naive and simplistic in some of its assertions (it is manifestly possible to talk about Christianity without talking about Christ, and, indeed, to talk about Christ without talking about the work of the Cross: Giles Fraser does it all the time, and there is a rational missiological argument for doing so). But at least it attempts to examine Ukip policy in the light of Scripture, and it does so by that favoured religio-political method of adducing Scripture to support a political worldview, rather than developing policy out of scriptural principles. In a liberal democratic state which has evolved out of centuries of broad Christian polity, it is not unreasonable for politicians and political parties to do this, if only for electoral purposes. Even the atheist/agnostic Winston Churchill invoked the Church of England and the Christian Faith when it suited him. He once described himself as a “buttress” of the Church of England, “support(ing) it from the outside” rather than being a pillar within. His writings and speeches consistently equate Christianity with enlightenment and Anglicanism with patriotism. When he spoke of Europe, it was as “the fountain of Christian faith and Christian ethics”. Despite professing no faith himself, he unashamedly (ab)used Christianity and the Church to affirm a quasi-prophetic self-belief in his destiny and the battle for national salvation. And he did so by talking about Christianity an awful lot more than he talked about Christ and the Cross. For Thatcher, Scripture gave “a view of the universe, a proper attitude to work, and principles to shape economic and social life”. It is how the theological ‘is’ translates into the political ‘ought’; how Christianity remains relevant to public policy. She derived from her understanding of the Bible a traditional conservative view of the family which is “at the heart of our society and the very nursery of civic virtue. And it is on the family that we in government build our own policies for welfare, education and care”. She was not deluded by the biblical ideal, recognising that “modern society is infinitely more complex” and that “new occasions teach new duties”. It’s just a pity that Bishop Pete doesn’t offer the same latitude. To him, it is all “deserving/undeserving stuff” which is “profoundly unChristian”. Is it really un-Christian to suggest that the sluggard who lies in his bed until midday is somehow less deserving of benefit, or the sloth who is too lazy to find employment is undeserving of welfare at all? Is it un-Christian to believe that if a man will not work, he shall not eat? Is it un-Christian to seek to distinguish between these cases of indolence and those manifestly deserving cases where people are simply unable to work through incapacity or disability? There are, of course, inherent tensions in the Christian’s walk of faith within the Conservative Party, and important distinctions to be drawn between Christianity and Conservatism. But that is surely true for all political parties. And the tragedy of the Church of England is that it has long refused and still cannot acknowledge that the Conservative vision may be Christian at all, or that Conservative values and principles may reflect anything of the mind of Christ. For left-leaning clerics, the “Judaeo-Christian tradition” is defined not so much by what it is for as what it is against: if the Tories are moderately malign, Ukip are positively evil. And since both are “right-wing”, they are symbiotic in their policy inspiration and co-active in their political praxis. 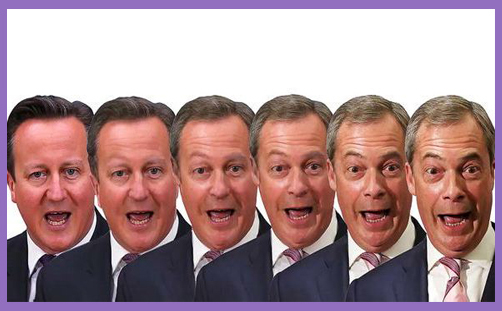 You may not agree with the Farage conception of the common good or Ukip’s apprehension of British political life. You may find both utterly antithetical to your Christian worldview. But to smear them as institutionally “racist” is puerile. It is also rather alienating for the 38-60% of the electorate who appear to support them. The National Church has a political obligation and theological mission to be national. When parties are polling at that level, it is incumbent upon parish priests and their bishops to engage in reasoned discourse to establish why, and that requires pastoral sensitivity, theological latitude and mature colloquy.